The CCS December 2018 returns are now available for completion on Pobal Online. The deadline for submitting the completed return is Friday 1st February 2019. If you have any questions or require assistance in completing the return, please contact your Support Officer. If you do not submit the return by the deadline, your future CCS payments may be affected. An announcement was made on 27 December that Dr Katherine Zappone, TD, the Minister for Children and Youth Affairs, had signed regulations providing for the registration of school age childcare services for the first time. Please see attached the regulations , guiding document and the Q&A document. These initial regulations are to allow both stand-alone school age childcare services and those located within existing preschool services to register and then be eligible to offer the new childcare scheme due to be launched later in the year. If you have a school age service within a preschool service you have until 18 August 2019 to register. These regulations come into effect on 18th February. At the moment there is no information about the registration process. As soon as we have the details, we will pass on the information. There seems to be a little bit of confusion between eligibility and entry points since the change from three entry points on to ECCE. The reason for having three entry points previously was to accommodate children who reached the eligibility age during the ECCE year. Now there is only one eligibility point – the child must be at least 2 years and 8 months old by the 31 August in the year in which they wish to start the ECCE scheme. However an eligible child can enter the ECCE programme at any time during the academic year. For example if a child was born on 23 February 2016, they are eligible to start the ECCE scheme in September 2019 but they don’t have to start in September, they can start at any time after that, as long as you have a space available for them. Aplications will open in February and more details will be circulated shortly. There are to be two rounds of capital funding this year with additional grant funding associated with the affordable childcare scheme to be announced later. At the moment, we do not have any more details on the application process or exactly what can be applied for, once we do we will keep you informed. The following training events are planned for 2019. 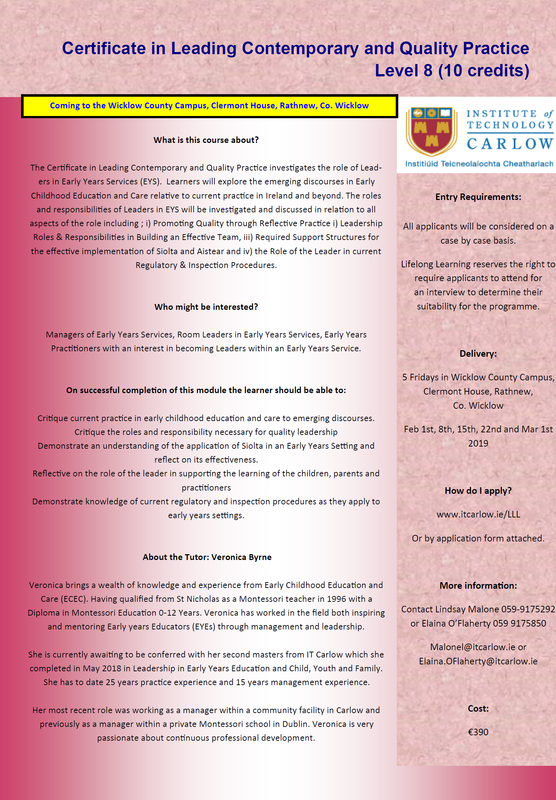 A few spaces left on our Pobal Compliance workshop below next Monday 21st in the Glenview. For details about each course click on link below for details and booking form.